When printing an invoice, the lines around each field wasn’t printed out, how to bring back all the missing lines? This isn’t a bug or error in your data file. 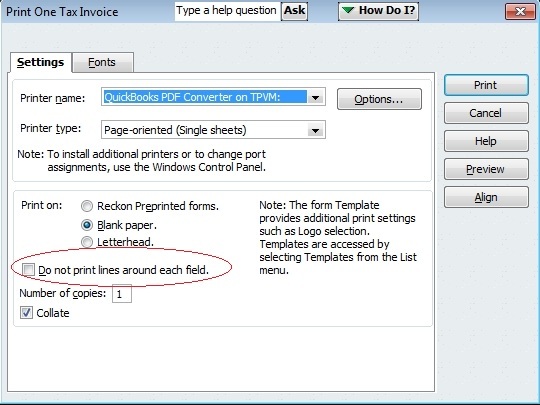 When printing invoices, user may have accidentally checked the check-box for “Do not print lines around each field”. By checking this check-box, all the lines around the field will not be printed. This entry was posted in Canadian version, QuickBooks, QuickBooks 2007/08, QuickBooks 2009/10, QuickBooks 2011, QuickBooks 2011/12, QuickBooks 2012, QuickBooks 2012/13, QuickBooks Asia, QuickBooks Australian version and tagged accounting software, QuickBooks, QuickBooks Asia, QuickBooks Singapore. Bookmark the permalink. Thanks for the information. That would be the right solution to bring back the missing lines.